You know those kids in the two to three year old range that don't look perpetually disheveled? I mean, I know they're out there. I've seen them out and about in town with pigtails and bows and every hair perfectly in place. I marvel when I see them, because I've never had one of my own. I've always had 2-3 ear olds with serious aversions to brushes and clips (hence last weeks hair cut for Mae). And now with her new short hair, she does look remarkably well groomed. I know that they grow out of it (one day Sadie just decided she liked having her hair done! Just like that!)... but that day still seems to be a ways off. Hopefully it arrives before Mae's new tresses reach her shoulders. 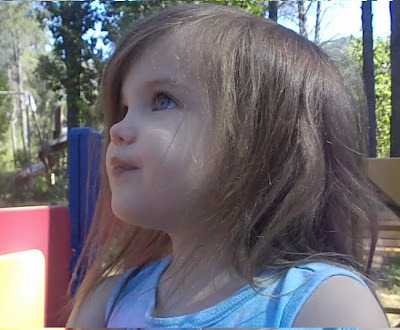 So when I read today's Theme Thursday theme and saw the word "knots" I couldn't help but think of that time before the hair cut (which is a good thing because my camera is still broken)... and the constant state of my just-turned-three year olds' hair when it was long. I would brush it. I'd spray it with leave in conditioner. Nothing worked. Within ten minutes it would be a complete mess again. It could be smooth and shiny and we'd get in the car and drive the three blocks to Mass and it would look like it hadn't seen a brush in weeks by the time we got there... so... short hair. I'm not sure this picture quite does justice to the situation but... yeah... knots. For more Theme Thursday head over to Clan Donaldson! Ugh, knotted hair is the worst. My middle daughter has fluffy wavy hair that knots so easily if I don't have it pulled back into a ponytail or braid. I remember my dad had to do my hair once and he tried to put it in a ponytail and it came out horrible! I started learning how to do my own hair after that. Ooh, I was that little girl who always had knots in her hair. But gee, she sure is cute though! My kids always have knots, too. I am in awe of those little kids who have the long, flowing tresses or the perfectly pulled back ponytails. My ponytails don't even start that way. Your daughter is a doll!